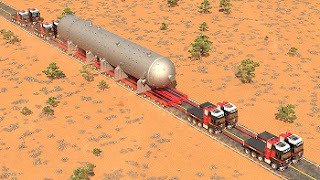 Only Mechanical Engineers dare to make and lift heavy weights using World’s Largest Giant Trailer. Untiring efforts of engineers at Mammoet have made it possible to convert this dream of a giant trailer into reality. Mammoet is world’s largest service provider with specialization in lifting and transporting heavy weights. Basically the idea is to develop a heavy transport solution called Trailer Power Assist (TPA). These trailers will be powered hydraulically thus lifting large and heavy equipment will not require combining several trucks. Traditionally, you might have seen that (multiple trailers) four or five trailers are used to transport heavy cargo. Two or four trucks are used at front to steer the movement and two or four trucks are used at back for support to the cargo/ heavy equipment. The trucks are mechanical connected with limited maneuverability. 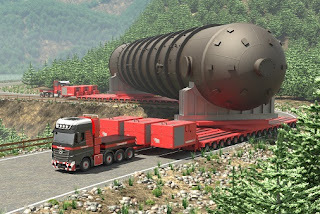 The new TPA-system has been initiated by Mammoet and developed in cooperation with SCHEUERLE, the leading manufacturer of heavy transport vehicles. TPA is based on the SCHEUERLE K25 trailer, which is fitted with a Power Pack Unit (PPU) that hydraulically powers 4 of the 6 axle lines. The PPU is mounted at one or either end of the trailer, depending on the configuration – or can be placed on the prime mover to replace the counterweight for traction. Each PPU is powered by a MTU V12 diesel engine, compliant with all emission requirements, that generates 1,000 horsepower and a traction power of over 40 tons. The TPA system is specified for all weather extremes. One TPA is equivalent to two trucks. Using this technology, only one truck will be required at the front to pull and steer the equipment. This means that only one experienced driver/ operator will be incharge here thus it will reduce any damages caused by communication gaps between several drivers of other trucks combined to move same cargo. TPA does not only provide more lifting capacity, but it also enhances speed of the vehicle. SCHEUERLE (Truck Manufacturing Company) is currently building two prototypes of TPA in a joint venture (JV) with Mammoet. In 2016, these two prototypes will be field-tested by Mammoet.